There are 128 posts in this thread, and it has been viewed 39770 times. There's also files attached. 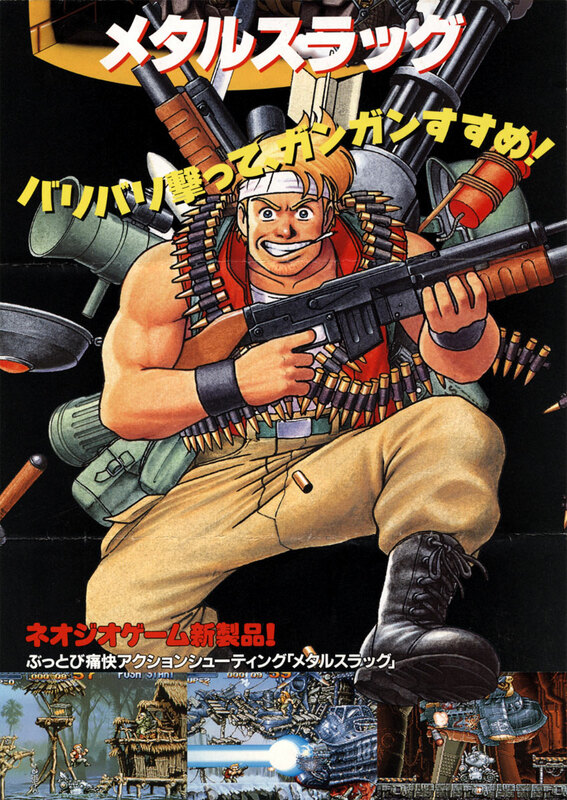 A classic game and a perfect game for this weeks Highscore Challenge is Metal Slug. 1. 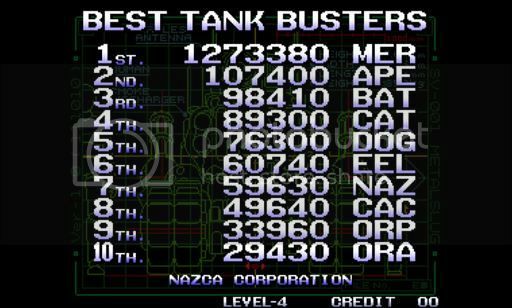 Gemant: Score: 2,920,430. , all clear, default settings (level 4 difficult) , Metal Slug (US version) , Played in august 2012. Replay approved from TG. After a smashing rampage I got to Mission 5. My score is 501,980. I had collected 3 metal slug tanks at the end of missions 1, 2 and 4 if you're interested. My player was Marco. Not only is it obvious that I play with Marco (unless you'd care to press the 2P and get Marco killed on purpose just to use Tarma) but I prefer him to Tarma. The hardest boss for me is General Morden's Jumbo Plane in the 2nd mission. Trigger happy Allen the sub-boss in Mission 3 took a lot of mad shooting to kill. Riko: Score: 220,850. Player: Marco, Stage: 3. On Stage 2 where you sink the 3 ships. You can jump on a ship and wait by the door where the men run out and keep knifing them. There seems to be no limit to the amount of men, so I would imagine you could keep doing this until your time runs out. Will (or Priest)- how do you get the bonus item near the start of the water section on Stage 2 ? (where the bridge arches begin). I haven't really tried yet since I think I will die if I try. Wow, so surprised not many people have entered this. Anyway, I finally got round to a first run through. TIP: Be sure to use the duck and throw grenades tactic on the bosses if you are in the Metal Slug. You can beat a lot of bosses this way before they even have a chance to do anything so it will save you lives. With difficulty you can get the bonus item in Stage 2 by the River Thames. Let the floating soldier blast the bridge section, then ensuring you've got leftover flames shots, shoot him. Run off the bridge and immediately at the same second pull your lever to the left and you should land on the bank where the bonus item is. It is tricky and chances are more likely drowning or the screen scrolling so the item and where it is no longer shows. That one isn't too hard to get, you just have to make sure you pull back instantly as soon as you fall. The harder one is the one actually on top of the bridge where he shoots, because if you don't run straight to it before he fires his weapon it will fall into the water. I tend to run up, grab the bonus and immediately pull back, wait till the bridge is destroyed, then kill him and jump down to get the other one on the little bank bit. Little things like this will bump up your score a lot, as well as destroying all scenery that is breakable! Riko: (realising I�m a bit late with this) The bonus item underneath the bridge in the begining of stage 2 is like Will and Kaz say real easy to reach, just pull the joystick to the left (and keep it there until you land) immediatily after you jump off the bridges ledge. Try it its really simple. Thank you for noticing this cheat. So no boosting the score by killing soldiers (in the spot RiKo eplained in his post earlier) is allowed. Kaz: Thanks for the strategy on how to beat the bosses easier. I did think about doing it that way- but I wasn't sure my man would move that far accross so I chickened out. I improved my score by using new scoring tactics of getting all the prisioners - gives you a huge bonus! Yea the POW are really rewarding to save both in a higher score and for me a sense of "feeling good". Try to keep the "Slugs" intact till the end of each stage for a higher bonus. Ok, been a while since I posted but I will give this one a try. First off, I don�t think owning a conversion is wrong especially when we are talking about titles which are extremely expensive to buy in its original form or titles which weren�t even released as AES versions. I own MVS -> AES conversions of "Neo turf masters / Big tournament golf", "Shock Troopers I" and "Art of fighting II" and I don�t regret buying these, will probably never sell them either. So be proud of your MS conversion. Thanx Priest, as for conversions I personally don't rate them and never will, each to his own I guess, I won't knock the people that purchase them, it can be a very touchy subject, there are pros and cons but I don't want to derail the thread. Once my CMVS 4 slot is fixed I am gonna purchase a MVS Metal Slug and whoever wants a Metal Slug AES to MVS convo can have mine. Well done Tony Starks That looks like your first go (looking at the high score table). I reckon you could beat this game without breaking a sweat! I think there was a thread on Neo-Geo.com about MS and ways to rack up points. Oh yeah Riko just out of curiosity do you own an original MS homecart? If so how much did it cost you? Hello Tony There's a Fatal Fury 2 challenge you can currently enter - if you have that game Priest might do a Fatal Fury challenge one day when there is no Game Of The Week. Since Fatal Fury has already been GOTW before the score challenge started. Oh no, I have the MVS version but I play it on my AES with a convertor - so it plays the same as the AES version. I would like the AES version but as you know it costs a bomb! Actually I just want to say that I was wrong about my exploit I mentioned earlier since you don't get any points for the guys you knife on the boat. Nazca were ahead of us on that one!